Welcome to the new Peak Performance website! Welcome to the new and spectacular Peak Performance Physical Therapy and Sports Medicine website! It has come at a great time for the clinic as we just relocated to our new flagship location at 26 Mass Ave in Arlington, MA on July 3rd, 2015. We now have over 1500 square feet of designated space exclusively for PT along with 2800 square feet for mats space for Mass Brazilian Jiu-Jitsu Arlington. As the owner of both business, it’s always been my dream to have both businesses in a state of the art facility and that time has finally come. Since moving to 26 Mass Ave, Peak Performance has seen significant growth in new patients and will continue to be a valuable asset to location residents of the area as they seek out orthopedic physicaltherapy care. Our patients range in age from as young as 10 to as old as 85 we have the experience to meet the needs of nearly any patient with sports or orthopedic issues. Along with our new space we have also added top of the line equipment to serve the needs of our patients and members of our performance training programs. We now have 2 large Rogue racks, several sets of each resistance band, dumbbells up to 60lbs, Assault Stationary Bike, Physioballs, mini bands,flat/incline benches and functional training systems. 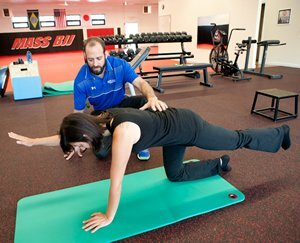 We have the tools to teach you everything you need to rehab your injury and then take your fitness to the next level. The future of Peak Performance looks bright and we look forward to continuing to grow in the community and offer top of the line services to our patient population. The biggest compliment anyone can pay us is by referring a friend or family member and we are extremely fortunate that this happens regularly. Come see why Peak Performance is a leading provider for orthopedic/sports physical therapy and performance training in the Arlington area.